One of the best ways to get fit and spend some quality time with loved ones is to combine the two. The key is to disguise “exercise” as just plain fun. Whether you’re looking for an endorphin high, adrenaline rush, or a relaxing escape, you’ll find an array of wholesome, healthy outdoor activities to suit every age and interest at Shelter Cove Harbour & Marina. In honor of National Family Health and Fitness Day (Saturday, September 26), here are a few suggested outings that are good for the body, mind and spirit. Mix and match for an unforgettable series of family fun and adventure. Shelter Cove Harbour is a central hub, easily accessible by bicycle from any area starting point. If you are on the Palmetto Dunes side of Hwy. 278, take the underpass to Shelter Cove and avoid crossing traffic at the busy intersection. 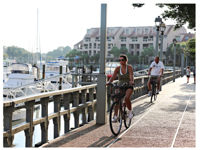 Once you reach the harbor, you can ride adjacent to the waterfront and/or lock up and delight in the amenities including shops, restaurants, fishing charters and a variety of water sports. Need wheels? Rent bicycles, including adult and kids’ cruisers, bikes with child seats, kiddie carts, tagalongs, tandems and three-wheelers as well as helmets forsafety directly from the Ship’s Store at Shelter Cove Harbour & Marina. If you’re not up to a cycling excursion, take the car and hoof it around the harbor on your own two feet. Shelter Cove Harbour is approximately one mile long from end to end. You might also choose to make a loop around the neighborhood. 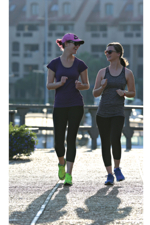 Make it a jog, fitness walk or leisurely stroll while you inhale some fresh air, get a sunny dose of vitamin D and feast your eyes on blue skies and the sparkling waters of Broad Creek. What could be healthier than that? Families who enjoy being on and in the water have multiple choices, from standup paddleboarding and kayaking, to tubing, waterskiing, kneeboarding and jetpacking, all available at Shelter Cove Marina. Visit the Outside Hilton Head kiosk and/or the Ship’s Store to sign in for your chosen activities. Grab coffee, sandwiches, snacks, soft drinks, beer and wine and/or get outfitted with coastal apparel, accessories, shoes and sunscreen at the Ship’s Store. 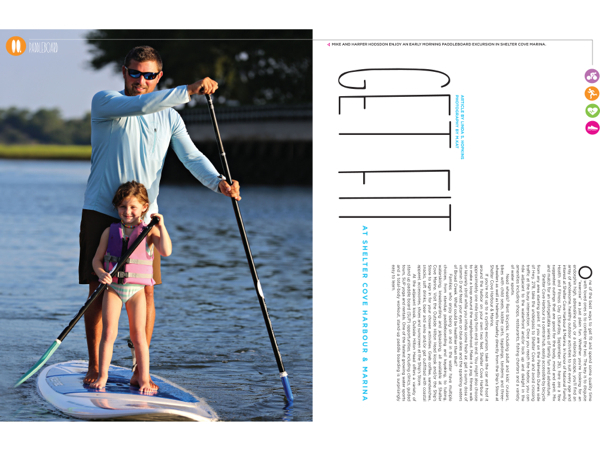 At the adjacent kiosk, Outside Hilton Head offers a variety of stand up paddle board (SUP) opportunities, including clinics, guided tours, SUP yoga and rentals. One of the fastest growing water sports and a total-body workout, stand-up paddle boarding is surprisingly easy to learn. As Caitlin and Abby Booe, sisters from Franklin, Indiana attest, it’s not as hard as it looks. “I thought I would be falling a lot, but I didn’t,” Caitlin said. Outside Hilton Head’s two-hour guided tour is like a nature hike on water—perfect for both beginners and experienced kayakers who want to see the salt marsh wildlife and learn more about the history and culture of the area. Longer tours include birding and beachcombing or a fishing excursion. Or, if you are looking to explore on your own, rentals are available. Looking for a little more action? Family Ski Day is a private charter for up to six people, departing Shelter Cove Marina and taking you to the towing grounds—a beautiful, calm-water secluded creek, where you will have several hours for tubing, water-skiing, wakeboarding and kneeboarding. The boat is equipped with all the gear and the USCG captain is a certified towing sports instructor. No prior experience is necessary. As a bonus, on the way to open waters, this unforgettable flying experience includes a relaxing boat ride through picturesque Broad Creek, where playful dolphins, an amazing variety of Lowcountry birds and other wildlife are sure to entertain. Think of it as a nature tour and action adventure trip all in one. Check out the videos online and make reservations for your unique experience. Sometimes the healthiest activity is one that allows you to get away from the hustle and bustle. If you and your family need a break from the fast lane, consider a relaxing cruise on one of Shelter Cove Marina’s many charter boats. Whether you’re looking to commune with nature, cast a net, drop a line or sail into the sunset, Shelter Cove Marina is where your escape begins. From large party boats to small fishing charters and private pontoons, Shelter Cove Marina offers just the right size trip to accommodate you and your family. If you’re not sure which boat to book or what experiences to choose, call the marina for expert guidance. The dolphin watch nature cruise on The Holiday was a hit with the Williams family, a group of 75 people, ages 16 months-73, here in August for a family reunion. Scott and Ashley Mitchell, who recently moved to Hilton Head Island were out on the same cruise with their four-year old twins and six-year old son. Adults and children alike came off the boat high-fiving the captain and bubbling over with joy. All were in awe of the natural beauty, the highlight being the up-close interaction with a pod of dolphins. Maybe you prefer to keep your feet on the ground. Who says shopping isn’t a sport? Leave the world behind and lose yourself in the hunt for bargains and treasures as you meander along the Mediterranean style harbor. You’ll find everything from designer clothing and fine art to souvenirs, casualwear, T-shirts and toys. Perhaps a little retail therapy is just what you need to relax and rejuvenate. Shelter Cove Harbour is also the ideal place to fuel up for your day of fun, refresh as needed, and relax when the sun goes down. You’ll find six waterfront restaurants, serving a variety of cuisines in a casual atmosphere, with indoor and outdoor seating options. Start with breakfast and coffee overlooking the peaceful waters; enjoy lunch with a view of the picturesque harbor; stop off for ice cream, lemonade, tea or a slushy as an afternoon pick-me-up; stick around for cocktails or a glass of wine as you wind down; and finish off your day with a delicious dinner and complimentary sunset. Shelter Cove Harbour is located at 1 Harbourside Ln., just opposite Palmetto Dunes Oceanfront Resort. Shelter Cove Marina is the largest marina on Hilton Head Island, set just off the Intracoastal Waterway, overlooking the wide reaches of Broad Creek. For further directions or information, call (843) 686-9697 or visit palmettodunes.com.